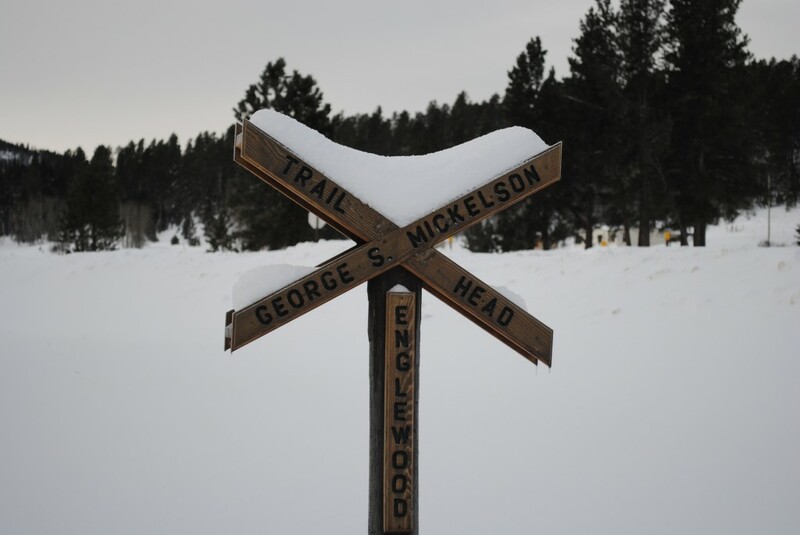 At mile 98.5 of the Mickelson Trail is the Englewood Trailhead. This location was originally called the Ten-mile Ranch and was a stop for the stagecoach, but the name was changed when the railroad came through. At one time, it was a busy little railroad location. There was a roundhouse, depot, water tower and rail yard. Some of the old foundations still exsist, but you’ll have to wait until spring to see those. Englewood is a great place to do some Black Hills snowshoeing. No motorized traffic is allowed for about a mile on either side of the trailhead. 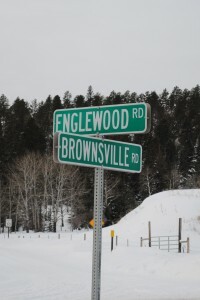 How do you get to the Englewood Trailhead? From Lead, head south on US Hwy 85. Turn left on Rochford road, after about 1 mile turn left on Brownsville road. You’ll find the trail head about a mile down the road. From US Hwy 385, turn west onto Brownsville road (it is the road right by “Boondocks”). Keep going about 6 miles until you see the trailhead at the corner of Englewood and Brownsville roads. How to get started in snowshoeing in the Black Hills? It has been said if you can walk you can snowshoe, and for the most part that is correct. It takes some getting used to but it is as simple as walking. However, don’t be surprised if your legs a little sore the next day. You don’t have to buy snowshoes to get started in the Black Hills. The Lead office of the South Dakota Game, Fish and Parks offers free day use of snowshoes. Their contact information is on their website. Also, remember that you must purchase a pass to use the Mickelson Trail, you can purchase the pass at the trailhead or online. Do you want to buy your own gear? You can buy snowshoes online and usually find a good pair of snowshoes for under $100. My recommendations would be: make sure the binding is adjustable and a set of telescoping poles are handy (but any ski poles will do). I’ve had real good luck with both Redfeather Snowshoes and Yukon Charlies Snowshoes , but any modern snowshoe should more than meet your needs. Where else can you snowshoe in the Black Hills? You can snowshoe basically anywhere there is snow cover. I snowshoe in my neighborhood after a fresh snow and on any trail that I hike in the summer. Iron Creek in Spearfish Canyon is a beautiful trail close to Spearfish. Eagle Cliff and Old Baldy are trails I hope to snowshoe soon. The Black Hills National Forest website has maps of more snowshoeing and cross-country skiing trails in the Black Hills. Be sure to avoid snowshoeing on groomed cross-country ski trails. Where have you been snowshoeing this winter?